Fig. 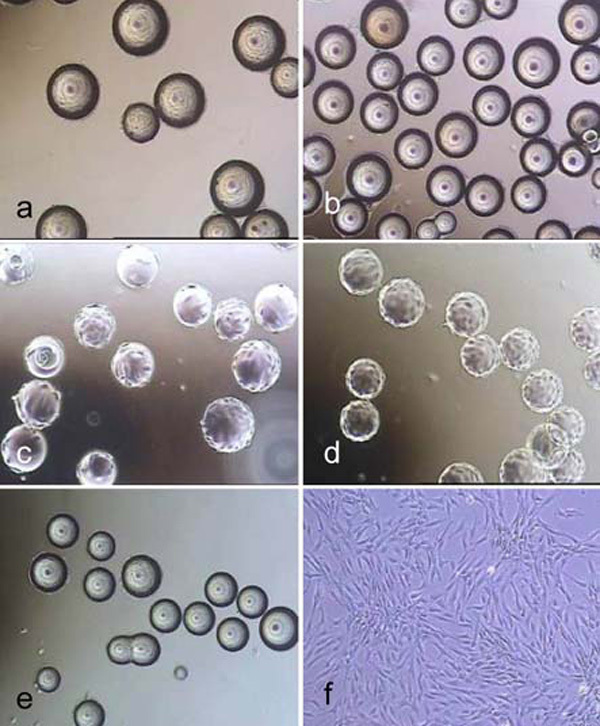 (1) Light microscope images of hMSC-TERT, cultured in spinner flasks (a-e) on Biosiln (a), RapidCell (b), Cytodex 1 (c), Cytodex 3 (d) and P102-L (e). Figure f shows hMSC-TERT in a monolayer culture (tissue culture flask). All images were taken on the 4th day of cultivation. Because of the opacity of Biosilon, RapidCell and P102-L, the cells are just visible at the “horizon” of the microcarriers.